A series of fortunate coincidences has largely shaped this trip for me so far. I'm very fortunate to have been put it touch with Noa, whose car I'm driving to Miami. (Well, firstly, I'm fortunate to have been accepted to LSE.) I'm fortunate to have found a $1/day car rental to Newark. And I'm fortunate to have found Ueli to travel with. And one of the most fortunate parts of this journey has been meeting some awesome people whom we've been couchsurfing with. It's amazing what people will do for others, and what has happened today is a testament to the power of people's kindness. I had forgotten my laptop in Houston. We had been driving through Louisiana for a couple hours already when we stopped for wifi and I noticed that it wasn't in my bag. So immediately, after double-checking the car, my heart sank. Could I have lost it? I knew I had last used it in Houston, at our host's house. So I called up our host Josue and asked him if he saw my laptop in his house, and alas, there it was. I sighed some relief, but then thought: Would I have to drive back so many hours to Houston to get it? We didn't have a host in New Orleans, so we could've just essentially spent another night in Houston. But I decided to give Josue my destination address in Miami and have him ship it ahead, so it'd be in Miami by the time of my arrival. I felt embarrassed, but so thankful to Josue for going through the trouble of shipping it to me. I was still feeling down from having forgotten my laptop as I drove on through Louisiana. The landscape was swampy but verdant. We began driving over a long bridge/causeway that swooped for 20 miles or so above water. 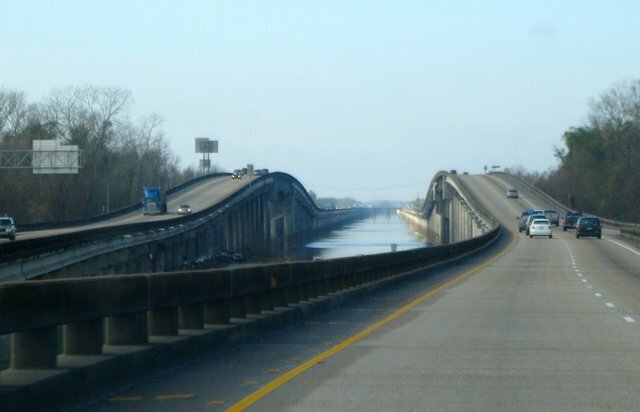 It was Atchafalaya River, but must've also been the spillway that was open to divert all the floodwater away from the Mississippi river. Ueli was asleep when I received a phone call. It was from Allen, a guy from couchsurfing who had seen my last-minute posting and who offered us a place to stay! Immediately my mood flipped, from downtrodden to absolutely ecstatic. It wasn't much longer until we were in Baton Rouge. I drove us over the Mississippi River and straight to the Louisiana State Capitol, which is actually the tallest state capitol building in the US (taller than Texas). It was closed so we just took pictures outside. We then drove to the river and I dipped my hands in (the slope into the river was covered in slimy sludge and did not seem like something I'd want to swim in). We then drove onward into New Orleans, filling up gas along the way. The sun set behind us, and a horde of motorcycle rides swooped along the freeway at breakneck speed. Lupe Fiasco's "The Show Goes On" played as we drove into the city, and I could feel the electric energy of the city. It was going to be a good night - and was I right! We headed straight for Allen's house - the windows down, letting in the steamy swampy city air. His dog Chelsea was particularly eager to welcome us. We only had a minute to settle down before he and his neighbor Isaac took us out to a local bar called the Maple Leaf. There was a band that they wanted to see (and whom Isaac knew), but a few other performers were on stage this night (peformers often just jam together and intermix bands). 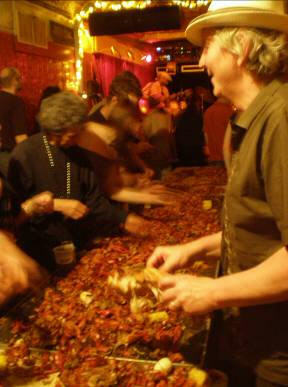 But the big attraction was that our $10 cover included not only live music but a real crawfish boil! It was crawfish season, and a crawfish boil is the way to eat it. It went like this: 5 or 6 tables were laid out end to end, then everyone claims a spot along the edge of this long table, then it comes - maybe 50 pounds of cajun seasoned crawfish (with all the sides, sausages, corn, potatoes, boudin, garlic, etc.) are just poured out onto the table. Everyone then just simply digs in. quickly grabbing a crawfish, snapping it in half, sucking out the juice, and pulling off the meat, and doing it over again until the crawfish shells really start piling up. Allen and Isaac taught Ueli and I how to eat crawfish properly, but we still didn't have the technique down. But what an amazing experience! While we were finishing up our crawfish, my friend Laney arrived! We grabbed a couple beers and caught up outside in the courtyard. I drank Ankita Amber, a popular local beer. And by the way, many bars in New Orleans don't even check IDs at the door; I've heard of a girl trying to give her ID to the person collecting the cover charge, and the bouncer saying, "no, I don't want your ID, I want your cash"! This is what people mean when they say NOLA is laid back and casual. But that's not all! While we were sitting in a dark corner at Snake and Jake's, someone sneaks up behind me to say hi. It was my friend Steffen! I knew that he was in New Orleans, visiting for the Memorial Day weekend from LA, but we didn't plan to meet up at Snake and Jake's - what a coincidence! And to think, a few hours ago we were desperate and without a clue about what we'd do in New Orleans! Everything ended up not only better than expected, but more amazing than I could have ever imagined!